KSA is a duct connection system for rectangular ductwork. Sealant has been applied to the KSA duct connector base. 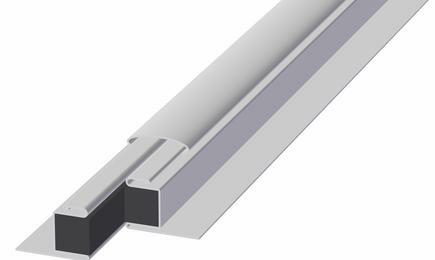 The duct connection system comes in a galvanised steel design. 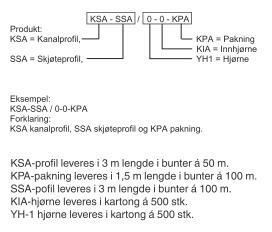 KSA and SSA profiles are delivered in 3m lengths, 50m and 100m per bundle respectively, and are cut to size using saw, cut-off wheel or similar. A manual (KPH) or pneumatic (KPL) hand-press can also be used to cut the KSA connector in lengths = B/H ÷ 10mm. Please see fig. 1. The KSA connector is pressed onto the duct end until it is fully attached, and can be secured as follows: fig. bolted, screwed or spot welded as shown in fig. 2 (A), or secured with compressing pliers as shown in fig. 2 (B). When all four sides of the KSA connector have been attached, the KIA inner bend is fitted and can be fixed in place by using compressing pliers. The KPA gasket is attached to the profile as shown in fig. 1, and the duct units can then be connected using the SSA track profile. When the sections have been joined, the YH-1 outer bend is fitted.